On October 21st, at the Cutler Majestic Theater, Opera Boston gave its first performance of Hector Berlioz’s last work, Béatrice et Bénédict, an opera comedy adapted from Shakespeare’s Much Ado About Nothing. It was performed with the music sung in French and the dialogue spoken in English, an effective approach that, strange though it may sound to some modern listeners, is fully in keeping with the traditions of comic opera. The production was directed by David Kneuss with Robert Perdziola serving as the scenic and costume designer. By the time Béatrice et Bénédict was premiered in 1863, the French had formalized the opera comique into an odd species of music-theater. Ensconced between the high spectacle-drama of grand opera and the toe-tapping satire of opéra bouffe, it often resulted in works that were too light-hearted to be serious, yet too polite to really be comic (i.e., works that can best be described as charming). This work certainly falls into that category: The story is simple, the music unassuming, and neither the characters nor the dialogue is particularly complex. The advantage to such a work is that it gives the performers a broad, beige canvas to color with their own specific skills. 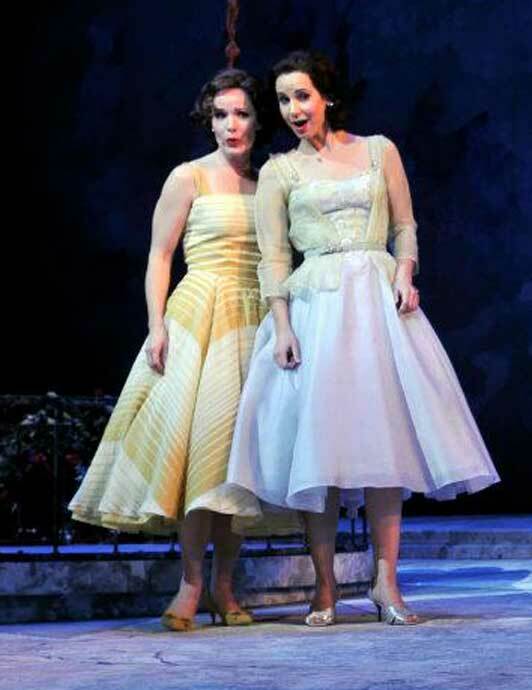 Opera Boston is nothing if not a troupe of highly skilled artists, though in this case they applied their abilities to varying degrees of success. 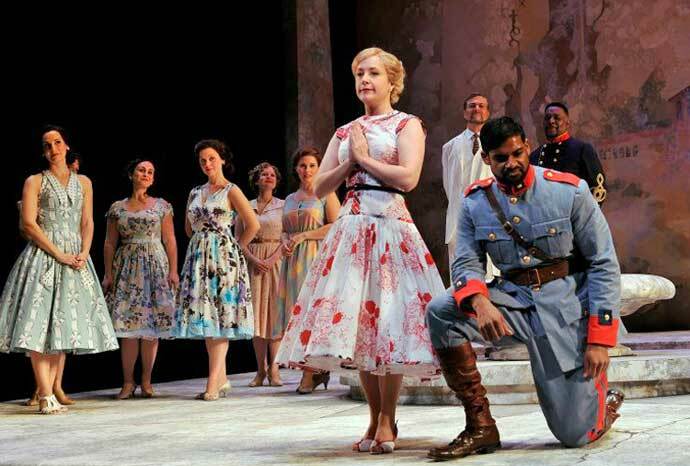 In the title roles were tenor Sean Panikkar and mezzo-soprano Julie Boulianne. Panikkar’s bright, easy voice had little trouble with Bénédict’s sung material, while his speech and general mannerisms were characteristic of modern, teenage, television comedies—entertaining, though somewhat disconnected from the pseudo-Shakespearian English of the translated dialogue. Boulianne’s rich, clear voice and confident stage presence were perfectly suited to the witty and sarcastic Béatrice of Act I, but did not deliver so convincingly as the lovelorn, tongue-tied Béatrice of Act II. In all fairness to Boulianne, though, while it is easy to believe that a young male could have his switch flipped from snarky youth to hormonally charged lover in an instant, it is not so much the case with a young woman; so a plausible transformation is harder to pull off. The other couple in the story are Hero, the cousin of Béatrice, and Claudio, her betrothed. Baritone David McFerrin did the best he could as Claudio, a character that, even in this dramatically simple context, is rather a non-entity, at least as far as the singing goes. In fact, Hero spends so much more stage time with her maid Ursule, that one might suspect her husband-to-be is just a beard. In this particular production, though, that was an advantage. Hero was played by soprano Heather Buck, whose voice is too mature for that of a young maiden; and she couldn’t quite act the part either. However, when paired with the delicious, sonic caramel of contralto Kelly O’Connor as Ursule, the result was magnificent. Their duet at the end of Act I—a gorgeously dreamy, slightly gloomy, and wondrously wistful nocturne—was the highlight of the evening. into the role of the pompously incompetent music master Somarone with flair and gusto. 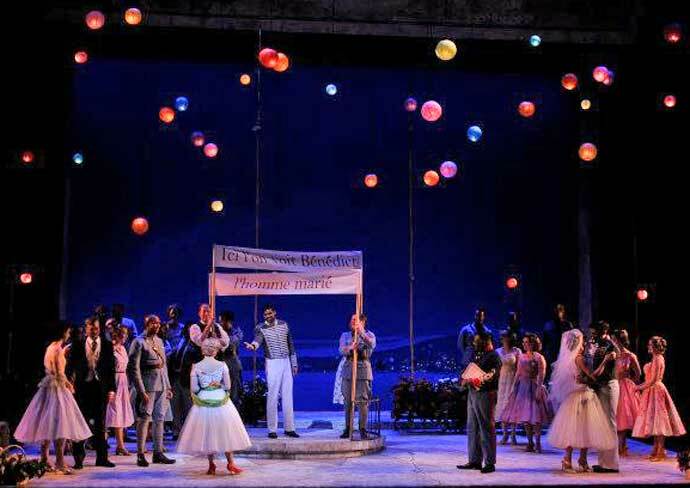 The most impressive support, however, came from the chorus, a group of men and women who sang beautifully—or not, when called for—while engaging in delightful little comic gestures that, over the course of the opera, gave each character in the ensemble a recognizable and enjoyable personality. The cast and orchestra were led by Opera Boston’s Music Director Gil Rose. As always, his technique was superb, resulting in clean instrumental performances and solid overall cohesion. A work like this, however, needs a bit more daring for it fully to come to life: more color in the overture, more mist in the Nocturne, and more sparkle and energy in the runs and off-beat pulses of the aria accompaniments. Rose’s approach, while sound, resulted in many missed opportunities that could have given the opera a wider variety of hues. The staging was simple in the best sense of the word, with some refreshingly low-tech effects, such as a twilight lakefront backdrop and multi-colored paper lanterns lowered from the fly loft creating a lovely atmosphere. The Majestic’s stage is small, so when everyone was on it, no one could move much. However, it would have been nice to have the characters use the space more when they were the only ones up there. Overall, the performance was a modest success. One came away neither disappointed nor excited, but rather with the easy satisfaction of someone who has enjoyed an herbal tea with honey and is now ready either for a more substantial drink or a peaceful night’s sleep.